31. If Jesus is Jehovah of the Old Testament and Elohim is referred to as God in the Old Testament, can you explain Deuteronomy 6:4 to me: “Hear, O Israel: the LORD (Jehovah) our God (Elohim) is one LORD (Jehovah)? “An alternate translation of the passage is ‘Hear, O Israel: The LORD [Jehovah] is our God [Elohim], the LORD alone’ (ESV footnote). In this case, ‘Elohim’ is used as a title meaning ‘God’ while ‘Jehovah’ is used as a proper name. Moreover, we must not make the mistake of thinking that the name-titles ‘Jehovah’ and ‘Elohim’ had those meanings anciently, or were always used that way in scripture—they did not, and were not. Marriages are not performed in heaven; they are performed on earth. The Mormon Church does not teach that marriages are performed in heaven. The marriage union, however, can last for eternity, if performed on earth by one holding authority from Christ, and entered into by righteous individuals who remain worthy. The Bible teaches that men and women are not complete before God without each other (See 1_Corinthians. 11:11). The Isaiah scripture reads, “…before me there was no God formed, neither shall there be after me.” Verse 11 then states, “I, even I, am the Lord; and beside me there is no saviour.” It is Christ (Jehovah) who is speaking. We have no Savior besides Christ. The idea of theosis was understood in the ancient church and was expounded upon by Saint Ireneus, Clement of Alexandria, Origen, and Justin Martyr, among others. The doctrine is that we have the possibility to gain the attributes of divinity, and that indeed, this is the very purpose of the Plan of Salvation. Those who are exalted into God’s presence inherit all that Christ has, including the power to create. However, there will never be another to supplant God the Father, nor a replacement for Jesus Christ. The image can be understood through an explanation of fatherhood. A man has a son who will grow up to become a father himself. He becomes a father, not the father. No one can ever supplant his father. 35. If God was once a man who progressed to becoming a God, how do you explain Psalm 90:2, “…even from everlasting to everlasting, thou art God”? Joseph Smith made a statement just before his death that Christ had done all that He’d seen his Father do. 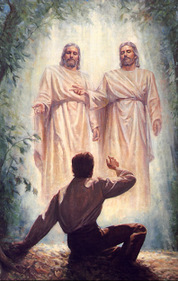 Joseph Smith pondered the possibility that God the Father had once been a savior to another earth. He was never able to elucidate on this idea, and everything since then has been speculative. Again, see question 20. The Seer was a publication that was officially disavowed by the First Presidency soon after it was published. So, this is not LDS doctrine. The Church of Jesus Christ of Latter-day Saints believes in the virgin birth of Christ, but has no doctrine about how such a miracle occurred. In the Book of Mormon it says Mary was carried away in the spirit, just as the Bible states. In the Garden of Gethsemane Christ suffered for the sins and sorrows of all humanity, which suffering culminated with His suffering and death on the cross. The atonement was accomplished when the Savior offered up His life. The cross is not used in the Mormon Church as the central symbol of Christ, because it centers on torture and death. 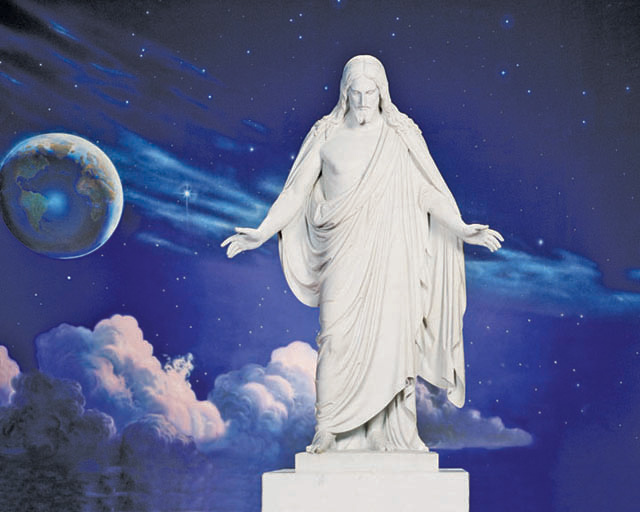 Pictures and sculptures of the living and resurrected Christ are common in LDS meetinghouses and temples, but none are used as icons in worship. 39. Why did Bruce McConkie write that a man may commit a sin so grievous that it will place him beyond the atoning blood of Christ (Mormon Doctrine, 1979, p. 93) when the Bible says that the blood of Christ cleanses us from all sin (1 John 1:7)? Wherefore I say unto you, All manner of sin and blasphemy shall be forgiven unto men: but the blasphemy against the Holy Ghost shall not be forgiven unto men. And whosoever speaketh a word against the Son of man, it shall be forgiven him: but whosoever speaketh against the Holy Ghost, it shall not be forgiven him, neither in this world, neither in the world to come. (Matthew 12:31–32). This sin is to reject the atoning power of Christ, even though a person has a perfect knowledge of it. In other words, he has personally seen the Christ and received a perfect witness of Him and later denies Him. 40. Why does the LDS Church teach that man first existed as spirits in heaven when I Corinthians 15:46 says that the physical body comes before the spiritual? From FairLDS.org: “1 Corinthians is not talking about the order of creation, but is talking about the regeneration of the wicked person into a spiritual, born again person. Thus, of course the physical (i.e., carnal) person comes first, and the spiritual (i.e., born again) person comes next when regenerated through Christ. Blessed be the God and Father of our Lord Jesus Christ, who hath blessed us with all spiritual blessings in heavenly places in Christ: According as he hath chosen us in him before the foundation of the world, that we should be holy and without blame before him in love (Ephesians 1:3-4). Furthermore we have had fathers of our flesh which corrected us, and we gave them reverence: shall we not much rather be in subjection unto the Father of spirits, and live (Hebrews 12:9)? Even before they were born, they, with many others, received their first lessons in the world of spirits and were prepared to come forth in the due time of the Lord to labor in his vineyard for the salvation of the souls of men (Doctrine and Covenants 138:56). But behold, the resurrection of Christ redeemeth mankind, yea, even all mankind, and bringeth them back into the presence of the Lord (Helaman 14:17).